I have been following several eco print groups on Facebook. There are lots of great ideas, beautiful results and helpful people in all these groups. Every now and again there will be a tip or trick that I feel I can apply to my work. Sometimes they turn out and sometimes they don’t. The scarves on the left side of each of the above photos are an example of a very interesting tip. After the mordant prepared silk was soaked in vinegar water and covered with foliage, I covered the whole thing with a piece of cloth soaked in ferrous sulphate (iron water) before it was rolled up for processing. Amazing what happened. 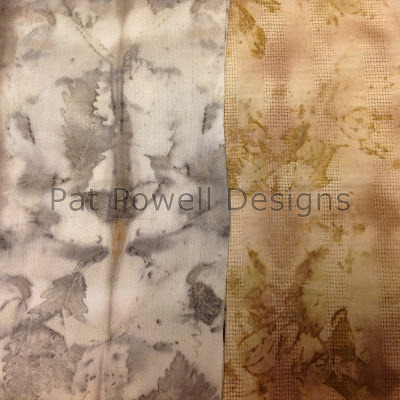 The scarves on the right were processed as I would normally process eucalyptus leaves to maintain the beautiful color. I decided to take this idea one step further and try it on a couple of scarves that did not turn out satisfactorily the first time. Now the sweet gum, eucalyptus, and bamboo really show up. The color is great. Here the oak leaves provided a great resist. The results were wonderful. It made me go back through all the scarves I had processed so far to see if any of them could use a little boost.